Every couple years I like to do a column on the most frequently asked questions. Of course there are many, but here are the top seven this year. You’ll notice that four out of the seven are about paint. It will always be the least expensive way to completely change a room. Thinkstock Opinions differ in regards to area rugs and whether all or half of the sofa and chair legs should be on the rug. 1) How do I know where to start and stop my paint? It’s easy to paint a single room, but when looking at open areas it can get tricky. I always try to stop paint at an inside corner. It’s really hard to get a straight line on the rounded edges of your walls. With our texture, even with painters tape, it can seep through. If you don’t have an inside corner that works, do not stop the paint in the middle of the curve. Stop it where the curve flattens out. 2) How high should I hang my artwork? When hanging artwork, I don’t like to hang anything more than 10 to 12 inches over the top of the furniture piece it is being hung behind and sometimes even lower, but never less than about 4 inches. Over a fireplace, I will hang it closer to the mantel since we’re already higher up on the wall. On just a wall with nothing underneath, the average height is 57 inches to the center of the piece. 3) Do I select my paint or floor first? Always, always, always select your flooring first, especially if you are painting and installing your floor at the same time. If you’re having the work done a couple months apart, at least decide on your flooring so you can make the right paint selection. Just know that there are no guarantees that any product you choose will be available once you’re ready to purchase it. Why select your floor first? There are many flooring options to choose from, but you are still limited depending upon what you want and your budget. This goes for any major investment in your home, such as upholstery, custom draperies, new counters and cabinets. On the other hand, paint colors are unlimited and all the colors cost the same. What you don’t want to do is waste your time and money by having to repaint to get a color that goes with your floor. 4) What size area rug do I buy for under my sofa? For under your upholstery, a lot depends on the room size, furniture placement and the traffic flow in and out of the room and area. The first concern with any area rug is safety and tripping. Do not have it extend out into any of the traffic flow areas, so watch if you’ll be stepping on it coming around a corner or walking through the room to the back patio door. I like to have at least the front legs on the rug; others will disagree and feel that all legs must be on the rug. But sometimes to get all the feet on the rug, it’s too big for the room. One thing I do not like is any rocking of furniture when all the legs are not on the rug. So you’ll either have to level the legs with pads or place all the legs on the rug. What you don’t want is to have it too small and just under your coffee table. It makes the coffee table look like a small island and doesn’t do anything to unify your furniture or arrangement. 5) Doesn’t a paint color get brighter when it goes on the wall? Not necessarily, there are many factors involved. I know many people feel that to get the color they want, they just go up or down on the color strip one color — not so. Each color is a separate formula, not just lighter or darker. My No. 1 design consultation is selecting paint; it can be a tricky process. Selecting paint is not a subject I can really address in a few words. But what I can tell you is to never select the color at the store without bringing a sample home. Once you narrow the color down, purchase a pint and try it at home. This is especially important if it’s a large job or a completely different color for you. You’ll want to paint four posters boards and hang them on the walls and move around during the day. Believe me, the small investment will save you in the long run. 6) Can I paint my ceiling something other than white? Absolutely, unless you have popcorn ceilings, which should stay white. 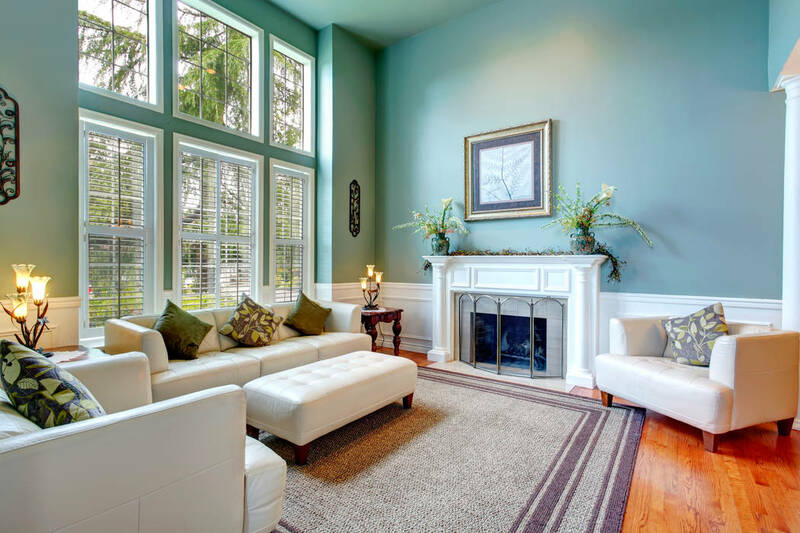 I especially like to paint the ceilings a different color than white when adding crown molding to a room. If the molding and ceiling are both white, you really can’t appreciate the money you’ve invested. 7) What will it cost to decorate my home? Sorry, there is no exact formula for this. Everyone has a different budget, taste, need and want. I’ve been asked if I can provide a number based on square footage. Absolutely not. You might want more or less than your neighbor who has the same square footage. For model homes, we quote by the square foot, but that’s after we’ve budgeted out every item, down to the ties on the bath towels. What about a percentage of my home value? This isn’t accurate either. I had a client who lived in a rental and spent $10,000 on a sectional and then another client in a $4,000,000 home who wouldn’t pay more than $3,000. The only way to know is to make a list of everything you want to do and start price shopping. When you’re done you’ll have your starting costs. Then from there, you’ll make your adjustments until it’s within your budget. Gail Mayhugh, owner of GMJ Interiors, is a professional interior designer and author of a book on the subject. Questions may be sent by email to:GMJinteriors@gmail.com. Or, mail to 7380 S. Eastern Ave., No. 124-272, Las Vegas, NV 89123. Her Web address is www.GMJinteriors.com.